#STOPScottishPower – Scottish Power announce they will take Friston site at Grove Wood through to Phase 4 Consultation having rejected Broom Covert, Sizewell. Scottish Power Renewables propose to build massive windfarm substations in open countryside in Suffolk. Scottish Power, a company which boasts about its ‘Green’ credentials threatens to turn open fields in rural Suffolk into one of Europes biggest wind farm substations or ‘Energy Hubs’. Wind energy has many benefits however communities in East Suffolk and the Suffolk Coast have learnt that ‘Green energy’ from offshore wind could have dire consequences for small peaceful Suffolk communities. Windfarm substations require huge industrial buildings and compounds. If planning is granted for Scottish Powers Energy Hub north of Friston it would set a precedent which could threaten the Suffolk countryside. 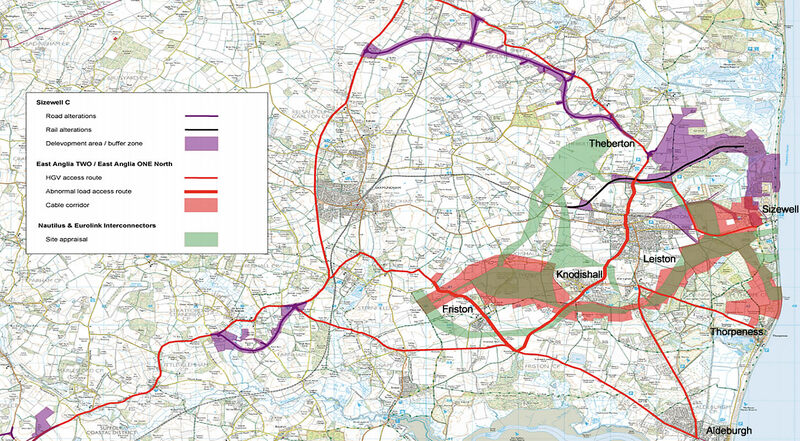 The proposed cable corridor alone would require trenching and haul roads from Thorpeness across the AONB through Aldringham, Knodishall and Friston. The substations themselves would devastate a greenfield site and change the whole nature of the village itself. This part of Suffolk is enjoyed by well over 8 million tourists annually. It is loved and respected by those who choose to live here. Scottish Power & others plan to make the Suffolk Coast – ‘The Energy Coast’ shows a complete disregard for the towns, villages and open countryside that make the area so special. Numerous energy proposals including EDFs (Sizewell C/D) , SPRs onshore development for off shore wind farms and National Grid Ventures (Interconnectors Nautilus & Eurolink) could destroy the character of this part of the Suffolk Coast for ever. The benefits WILL NEVER outweigh the devastation and destruction caused by these projects. ‘The Coastal Warzone MAP’ We have released an overlayed map displaying the known energy proposals affecting our small communities and Suffolk Coast & Heaths AONB. SPR Proposed Substaion Site View From Grove Road, Friston Before EA1N & EA2. SPR Proposed Substation Sites Indicative View From Grove Road, Friston After EA1N & EA2. 35+ acres of industrial buildings and concrete over a greenfield site in the countryside. Just a few hundred metres from the nearest homes and numerous listed property including Friston church, the substations will dwarf Friston village and will be visible from all routes into the village. The substation complex will permanently blight Friston village, and will be detrimental to Friston residents quality of life and the value of their property, especially closer to the substations to the north of the village. Construction issues – Roads and country lanes are unsuitable to handle heavy or wide construction traffic. The proposals would be dangerous for other vehicles, cyclists and walkers using the roads. Noise, dust and light pollution during the build. Legacy of negative visual impact, potential of anti-social noise and light pollution during operation. Unacceptable flood risk to Friston village and residents homes from surface water proposals. Destruction of habitat for rare wildlife including 3 species of bat, badgers and barn owls all found at the Friston location. Longest and most disruptive cable route required 10+ km with the need to dig up swathes of the AONB. Loss of amenity, loss of well used footpaths and loss of village allotments. Digging up and closure of popular coastal footpaths including over a mile of the ‘Sandlings Walk’ between Friston and Coldfair Green. Possible closure of Thorpeness beach during cable landing. A precedent would be set that could threaten other towns and villages and the Suffolk we know and love. Effectively 6 projects are proposed for this small area along the Suffolk Coast. Sign our petition – Over 2000 Say ‘NO’ to Scottish Powers proposals to build industrial substations at Friston in Suffolk countryside. #STOPScottishPower from damaging communities and villages in and around the Suffolk Coast. SASES.ORG.UK stands for ‘Substation Action Save East Suffolk’ we are an action group representing the communities in East Suffolk and on the Suffolk Coast. Whilst we all need electricity we should not have to suffer at the hands of big power companies. We aim to fight poor decisions that impact on communities and residents in East Suffolk and we will hold energy companies and government energy policy to account. 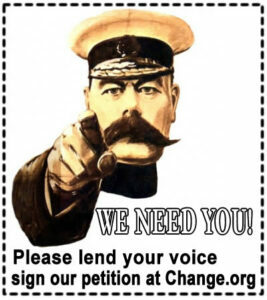 HOW WILL SASES.ORG.UK MAKE A DIFFERENCE? We will expose the poor consultation and decision making of Scottish Power Iberdrola. We will fight for communities and the sanctity of village life. We will stop industrialisation of the countryside a precedent cannot be made allowing Scottish Power or other energy companies to build substations next to villages or towns within rural locations. The government needs to agree designated locations for this kind of energy infrastructure. We will push for joined up thinking and sense on energy policy, we will Save East Suffolk! We stand with a united voice, residents in East Suffolk and the Suffolk Coast will not accept this precedent to be set. We will fight to ensure substations are not built in randomly selected locations when there is suitable land closer to Sizewell, nearer to the coast and cable landfall. The energy companies must work together with EDF (Sizewell Power Station) & Magnox (Sizewell – Nuclear Decommissioning Authority) they must find an acceptable solution that causes less damage to communities and the sensitive environment of the Suffolk Coast AONB. Suffolk Coastal MP Dr Therese Coffey has published her written response to Phase 3.5 Consultation. 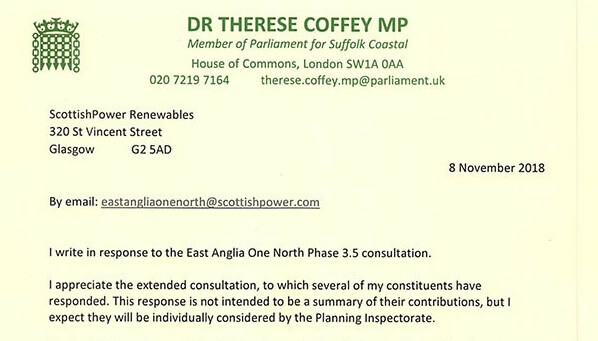 In the letter Dr Coffey appears to be more engaged in the consultation with an understanding of the connection issues in the Leiston/Sizewell area (including Friston). She reiterates a case for National Grid to explore options outside the area and offers Bradwell as an ‘ideal candidate’. Many including SASES have brought up the role of National Grid, who permitted SPR to walk away from their originally agreed connection via Bawdsey to Bramford for the EA1N & EA2 projects. It now appears National Grid failed to consider the huge implications of this and subsequent decision to grant a new connection in the ‘Sizewell’ area. The impact is huge both environmentally and physically.